I’ve been attempting to write about Sir Patrick Geddes for the last couple of weeks, and finding it quite difficult to pin him down. And then it occurred to me that, if I were to ask the man himself, he would undoubtedly prefer to be written about in visual terms, if that isn’t too much of a contradiction. The thing is that Geddes was a unique phenomenon: energetic, forceful, highly intelligent, yet impatient of the old-fashioned rules that governed the world of academia. He was a gifted teacher, but his inspiration was image-based, stemming from visions which sprang from deep within himself. So, instead of treating his life as one continuous thread, I will dip in and out of it at random; the effect might be a bit like a collage, but I hope it will also reveal the breadth of Geddes’ wisdom, which shone clearly through everything he did. Possibly the most profound experience in Geddes’ life came when he was 27, while living in Mexico. In 1879 he had travelled there to carry out zoological research, but found himself struck with an inexplicable illness which left him totally blind. It was temporary, although Geddes had no way of knowing it; and as he sat in a darkened room with his eyes bandaged, he found himself groping for light within the depths of his own soul. It came to him in vivid flashes of understanding, which stayed with him for the rest of his life and formed the touchstone of his work. Navigating by feel around his house, his fingers would explore a hallway window consisting of nine small panes of glass: in his mind, these squares, each leading to the next in a repetitive pattern, became the containers from which one concept would naturally flow into another. He had found what he called ‘a thinking machine’, and he used it to describe how people interact with each other, with their immediate environment, and with the planet. The fourth son of an officer of the Black Watch, Geddes was born in Ballater but raised in Perth: his home was Mount Tabor on Kinnoull Hill. The attitude of Alexander and Janet Geddes towards their children’s education was delightfully organic. Patrick recalled “growing up in a garden”, full of flowers, vegetables and fruit; by planting potatoes, his father gave him his first lessons in mathematics, and on Sunday afternoons the whole family would take a leisurely walk around the garden, examining every new shoot and leaf and studying the emerging blossoms. When Patrick became a father himself, he made sure that his children’s home schooling was “an education for peace” whose essence was the perfect cycle of “heart, hand and head”. Perhaps not surprisingly, in view of his open-eyed but unorthodox upbringing, Patrick’s first experience of academia came as a cold, sharp shock. He enrolled at Edinburgh University to study botany but returned home after a week, frustrated by the limited and inflexible scope of the course. To Geddes, specialism was an alien concept: in his mind, everything – every living organism and every landscape – was inextricably linked, and to study just one subject in exhaustive detail was to lose sight of the whole. It was a daring stance, and Geddes took it a step further: not only did he blur the boundaries between the sciences, but he dipped his brush generously into the arts, creating a quarterly magazine called ‘The Evergreen‘ which overflowed with prose and poetry inspired by the seasons. 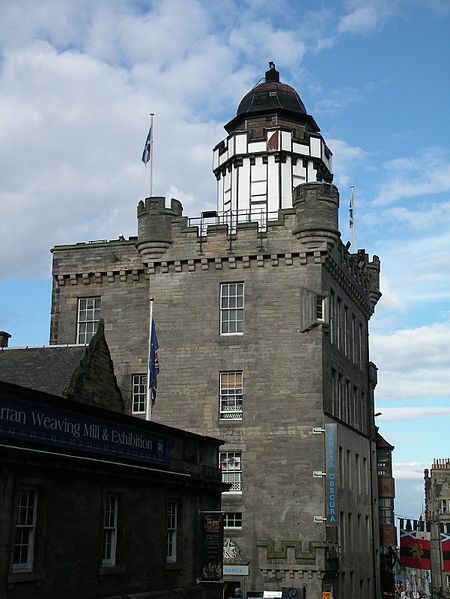 In 1895, Geddes purchased Short’s Observatory at the top of the Royal Mile in Edinburgh. This five-storey tower house was equipped with astronomical telescopes and a camera obscura, but was now in need of repair. Geddes saw an immediate opportunity, and four years later he opened ‘the world’s first sociological laboratory’. He named it the Outlook Tower, and with overwhelming zeal he set about changing the outlook of its visitors. Exuding the kind of joyful abandon that would give modern-day health inspectors a heart attack, he would welcome unsuspecting guests through the door and then make them rush headlong up the tight spiral staircase to the top, where they arrived, breathless and perspiring. Having effectively swept their minds clear of trivia, Geddes then used the camera obscura to project an image of the street below onto a large table, and asked his visitors to study the passers-by in their immediate environment. A period of quiet meditation followed – possibly quite welcome – to internalise what they had observed; and the guests then descended more slowly, through a sequence of rooms representing the city of Edinburgh, Scotland, Britain, Europe, and finally the world. The foyer was adorned with stained-glass windows in different colours, each with a scientific title such as ‘zoology’ or ‘botany’ – an elegant reference to Geddes’ belief that narrow fields of study restrict our perception of life. One of Geddes’ acquaintances remarked that the task of clearing up after one of his demonstrations was like trying to put the lava back into a volcano immediately after an eruption. His wife, Anna, must have been dotingly tolerant, but even she might have raised an eyebrow when Geddes proposed moving from their comfortable home into Edinburgh’s Old Town, a notoriously squalid district which was addled with poverty and disease. (Sometimes I think that the journals of scientists and explorers‘ wives would make illuminating reading.) In any case, six months after they were married, Anna and Patrick were scrubbing and painting their run-down flat in James Court, just off the Lawnmarket in the Royal Mile. But there was more to this than just a social experiment: Geddes, as always, had a plan. Before long, their neighbours were organised into community groups, galvanised into cleaning up their living quarters and improving their lifestyle. Anna set up sewing classes while Patrick’s ambitions spread outwards into all the tenement blocks and dingy courtyards. He rejuvenated the ancient Riddle’s Court, converting it into a students’ hostel, and breathed fresh life into the buildings that are now Ramsay Garden; he would often be seen in an old nightshirt, painting bright colours over dirty walls, and wherever there was enough space he would squeeze in a small park or a garden. If Edinburgh’s Old Town has a patron saint, it must be Patrick Geddes. Geddes created the layout for Edinburgh’s Zoological Gardens, ensuring that they were beautifully designed and a pleasure to experience, even before the arrival of their inhabitants. It was slightly ironic that, despite his intolerance of contemporary teaching methods, Geddes needed an academic position in order to earn money. After leaving Perth Academy he worked in banking for a while, but this was not the most obvious career move for someone who protested that he “can’t and won’t keep accounts”. He started a course at the Royal School of Mines in London and then found a post as a demonstrator in the laboratory of John Burdon Sanderson at the University of London, where, over the lens of a microscope, he had an unexpected but eager onlooker in the figure of Charles Darwin. A generous benefactor endowed a part-time Chair of Botany for Geddes at Dundee; and he set up a series of summer schools in Edinburgh, making use of an old canal barge which his pupils called ‘The Ark’. Featuring topics as diverse as social evolution, psychology and practical botany, Geddes’ lessons were highly popular, attracting students from all over Britain as well as Europe and America, and his classes included a number of women, for whom further education was still a very slowly opening door. With his infectious enthusiasm, he was the spark that lit the fire in many young scientists and explorers, including William Speirs Bruce. In 1925 Geddes established the ‘College des Ecossais‘ or Scots College in Montpellier, France. His inspiration harked back to the medieval age, when young people would tour Europe to draw their learning from different cultures. He took his students on long walks in the surrounding countryside and cultivated a ‘teaching garden’, which would undoubtedly have gladdened his father’s heart. An early environmentalist and town planner, Patrick Geddes coined the terms ‘conurbation’ and ‘megalopolis’. He is responsible for designing the layout of Tel Aviv. In 1915, Geddes travelled to India on the invitation of Lord Pentland, Governor of Madras. His commission was to prepare plans for the development of at least 18 towns and cities, bringing his unique blend of perception and innovation to create a living space that was beneficial to all. 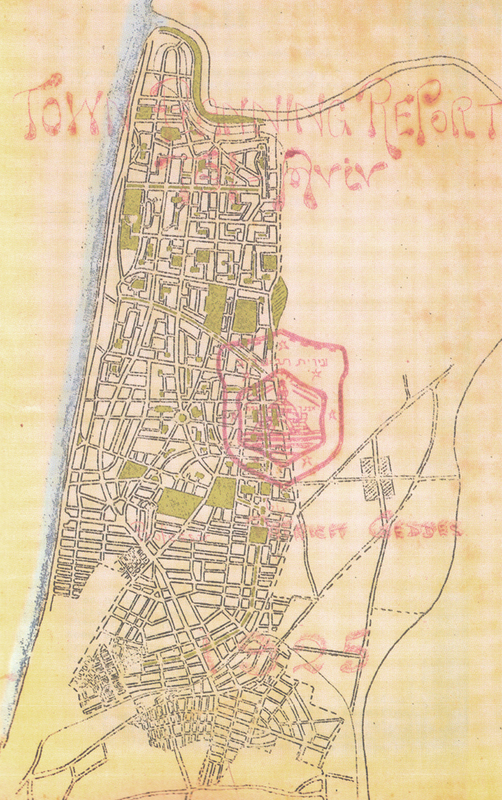 Needless to say, for Patrick Geddes this wasn’t just a matter of drawing some streets on a piece of paper. To the curiosity of the local people, he walked around the towns, observing, questioning, and recording. In the city of Indore his presence was regarded at first with suspicion, and his guide reluctantly admitted that he was being condemned as ‘the old Sahib that brings the plague’. This sent Geddes to the ruling prince of Indore, with an audacious request: he wanted to be made Maharajah for a day. The parade took in almost every part of the city before culminating in a garden suburb, where there were fireworks and a bonfire for the symbolic burning of the pestilential rat. As a result of all the cleaning, the people of Indore had a new-found pride in their city; and the plague disappeared from its streets. Geddes had fully justified his day-long role as a Maharajah. What else can I say about Patrick Geddes? If he’d been born in the 20th century, he would certainly have embraced the New Age movement, and with his good looks and pop-star hair he might even have been a headliner at Glastonbury. His life seems less of a sequence of events than a collection of overlapping worlds, making you feel as if you’re reading several different biographies while wrestling with an octopus. Time, for him, probably meant nothing. He was thinking outside the box before anyone knew that there was a box to think in; he had the energy of a true visionary and the courage to act upon it. Professor Patrick Geddes was elected a Council Member of the RSGS in 1896, and played an important role in shaping the fledgling Society. The Geddes Environment Medal was introduced in 2009, honouring people who find innovative solutions to man’s increasing impact on the Earth’s natural environments. Wow! I can see why you had a struggle on your hands writing about this chap. As you say, he seems to have lived several lives at once. I had no idea he had those connections to Edinburgh’s old town. What a remarkable achievement to have cleaned up the slummy bits and then done something similar in India. I wonder what he’d think if he could see the prices those Edinburgh properties fetch now. You’ve done a sterling job bringing him to life, Jo, I was utterly compelled from start to finish. Exquisite photographs, too. Another splendid post. Thank you, Lorna! 🙂 It was hard to know what to do with Geddes, and when to finish as well! So glad you enjoyed it. Yes, I had no idea he did so much in the Old Town – what a visionary, and not afraid to get his hands dirty. I’m sure those Ramsay Garden houses must be worth a fortune now! You’re right, Pat, Geddes would have loved the internet, I’m sure! I think he’d also be happy to see so much of his philosophy being accepted. I loved his book for children, which convinced me that he was a gifted teacher. I hope you enjoy the links, and thanks for your kind words! Anyone able to tell me what species of tree is in the garden by the statue of Sir Patrick in Edinburgh?